Computer recycling and disposal by TBF Computing, INC. Your old computer equipment is our business. We offer computer recycling and disposal services to the fortune 1000, colleges, and school districts. We offer custom solutions for your company's computer disposal needs. We handle all of the aspects involving your computer disposal. Tell us what your needs are and we will create a proposal to meet your needs. We respect your data privacy and security by using NIST Hard Drive data wiping procedures and in-house shredding of electronic storage media. We can assist in equipment deinstallation and preparation for shipment. Does your office have a pile of surplus equipment? We offer free pick-up for the Atlanta Metro Area. Request a free, no obligation, quote to find out how much all of your company's old computer equipment is worth. We will send a technician to your location to make a preliminary inventory list if required. We will make you an offer for the equipment. Our technicians are sent to your location(s) to deinstall and or dismantle computer equipment, and data centers. We stage it and prepare it for shipment to our warehouse. We use a network of truck drivers to pick freight up all over the nation. When servicing companies in the Atlanta metro area, we use our company owned truck. We can create serial number lists of equipment picked up on pickup if needed. We specialize in working with companies who have hundreds to thousands of locations. We create a detailed inventory list of equipment received. The equipment's weight, brand, model, serial number, asset tag number(s), and more can all be captured. We process, sort, and test your equipment at our warehouse in Kennesaw, GA. We assess for value, test for functionality, repair equipment if needed, and break down scrap equipment. Some circuit board level repairs are performed. Capacitors may be replaced, chips may be resoldered onto a board, and or connectors may be repaired. As technicians process your equipment your data is destroyed. We use the same software the government uses to destroy all data on your hard drives. All other magnetic media is shredded in a SEM 20 horsepower shredder. We provide you with a certificate of data destruction with our guarantee that your data has been destroyed. The certificate of data destruction optionally will include the serialized inventory list. We remarket equipment to end users and wholesalers worldwide. Almost all scrap material is de-manufactured in Kennesaw, GA. Computers, printers, and monitors are broken down into their base components: steel, aluminum, plastic, circuit board, glass, and copper. You can offer equipment to your employees or have us prepare equipment for donation to a charity. We are confident that we can help your company recoup the most out of its old computer equipment. Call us and find out! We are registered with the state of Georgia as a Computer Recycler. Great care is taken to ensure your equipment will not end up in a landfill. We believe the best recycling method is reuse. We test all equipment for remarketting. If it fails or is unrepairable and not remarkettable it is recycled. Virtually every component of computer equipment is broken down and recycled. We demanufacture scrap computer equipment into it's base components - glass, steel, copper wire, aluminum, circuit boards, plastics, batteries and other categories. 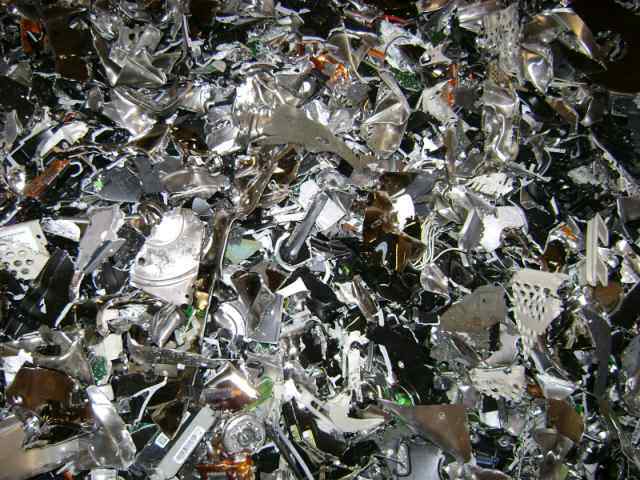 Seperated scrap material is passed onto several intermediary processor facilities who take the scrap materials into the next step of recycling. 90% of scrap materials are passed onto R2 Certified companies. This lets you rest assured that your material will be recycled properly. Keep your company compliant. Our data destruction procedures are compliant with HIPAA, Gramm-Leach-Bliley Act, Sarbanes-Oxley Act, The Patriot Act, Identity Theft and Assumption Deterrence Act, and others. We will format all of your old hard drives with the same software the government uses on their own computers. We use dban to wipe hard drives. During the the wiping process, many drives fail. 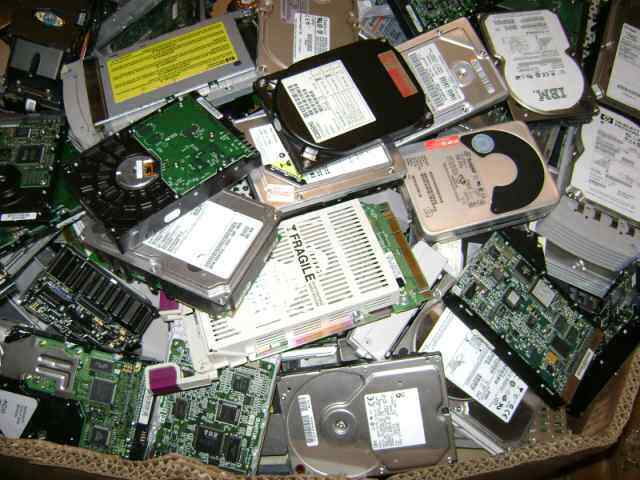 These defective hard drives along with all tape media, floppy disks, and cdrom disks are shredded by default. Per contract requirements, we will shred all of your hard drives and magnetic media. We shred any defective hard drives which can not be properly wiped. Contact us for a quote. Tell us about your shredding needs and we will create a solution tailored for you. 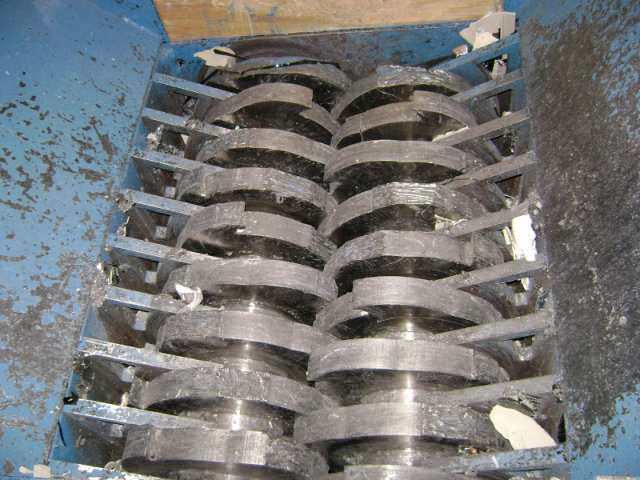 TBF Computing, INC. owns and operates a purpose built hydraulic twin shaft shredder for shredding electronic equipment and magnetic storage media such as hard drives and tape cartridges. Hard drives are reduced to small pieces. Data is unrecoverable. The pieces are recycled. We maintain a chain of custoday when we perform the pickup with our employees and company owned trucks within a 500 mile radius of Atlanta. A video recording can be made available as well. We can record serial numbers of the units we are shredding. We will provide you with a certificate of data destruction. Do you have decommissioned and or surplus computer equipment for sale? Contact us today. We buy everything computer related including, but not limited to computers, monitors, laptops, servers, switches, routers, phone systems, storage arrays, ups backups, tape drives, memory, hard drives, racks, data center equipment, and cpus. We give you the maximum return on your old equipment! Do you have hundreds of small offices in different locations?No problem, we pickup nationwide!Do your offices lack supplies such as pallets and stretchwrap?No problem, we come prepared!Do your offices lack loading docks?No problem, we'll send a truck with a lift gate!Is your office on the 30th floor?No problem, we come prepared with buggies, carts, and or whatever other equipment is necessary to facilitate the moving of your equipment to the building's loading area. * We have the capability to fit within your logistical requirements. If you can say yes to any of these questions, call us TODAY! Do you have 100 locations or more, from which you send equipment to a central location? Do you not want to bother handling the equipment with your own manpower? Do you not have the time to handle the equipment back at your company's warehouse? Are you preparing to a refresh across multiple locations? We can help you send it straight to us from all of your locations. We handle your equipment from A to Z. We can help you get top dollar for your used equipment by buying it out right or revenue sharing. Generally speaking, there is no charge to drop off equipment except for CRT Monitors and Televisions. However, TBF Computing reserves the right to decline to accept any material free of charge, especially in instances where unusually large volumes of low-end equipment that require excessive handling exist. If you are concerned that there may be a charge for the equipment you will be dropping off, please feel free to contact us ahead of time by phone to discuss specifics. We accept drop offs of computer and electronic equipment to be recycled. Just come by and someone will help you unload your vehicle. No appointment is neccessary. Take exit 271 for Chastain Road. Take a left on Chastain Road. Turn left onto Duncan Road NW. Take your first left into the building complex, we are in the building on your right. Drive through the truck court loading area. Look for suite 350 on your right about half way down. Take exit 271 for Chastain Road. Take a right on Chastain Road. Please complete the contact form if you are a business in need of electronics and computer recycling. Do you have customers who need their data destroyed or need maximum return for their old computer equipment? Copyright 2008-2018. TBF Computing, INC.